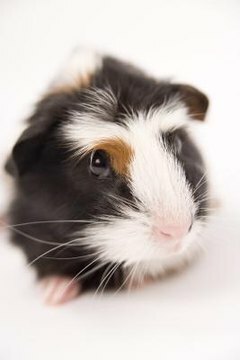 Using hay in guinea pig cages takes care of two issues at once -- nutrition and bedding. If possible, purchase a bale of quality hay from a farmer or farm supply store rather than the small bags of hay available in pet stores. If you have the storage space, not only is the bale cheaper but it hasn't been dried as is often the case with prepackaged hay. Drying makes it less suitable as bedding. Guinea pigs always should have access to grass or timothy hay. The fiber helps wear down their continuously growing teeth, preventing dental difficulties. It also keeps their digestive tract moving, lessening the chance of potentially deadly intestinal impaction. If you opt for hay as bedding, make sure to remove any soiled material daily. Although hay doesn't control odors like some other bedding products, it's probably your pet's choice if he has a vote. Not only can he nibble on it, but it provides areas for tunneling and playing. If you do need something more absorbent to reduce odor, consider using shredded paper-based bedding designed for rodents as a substrate, placing hay on top of it.